^ Hair loss. NHS Choices. [22 September 2013]. （原始内容存档于27 September 2013）. 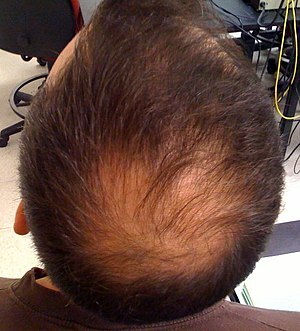 ^ 2.0 2.1 2.2 Nalluri, R; Harries, M. Alopecia in general medicine.. Clinical medicine (London, England). February 2016, 16 (1): 74–8. PMID 26833522. doi:10.7861/clinmedicine.16-1-74. ^ 3.00 3.01 3.02 3.03 3.04 3.05 3.06 3.07 3.08 3.09 3.10 Vary JC, Jr. Selected Disorders of Skin Appendages--Acne, Alopecia, Hyperhidrosis.. The Medical clinics of North America. November 2015, 99 (6): 1195–211. PMID 26476248. doi:10.1016/j.mcna.2015.07.003. ^ McElwee, K. J.; Shapiro, J. S. Promising therapies for treating and/or preventing androgenic alopecia. Skin therapy letter. 2012, 17 (6): 1–4. PMID 22735503. （原始内容存档于2015-12-12）. ^ 5.0 5.1 Leavitt, M. Understanding and Management of Female Pattern Alopecia. Facial Plastic Surgery. 2008, 24 (4): 414–427. PMID 19034818. doi:10.1055/s-0028-1102905. ^ Hair loss. NHS Choices. [22 September 2013]. ^ Hair loss. DermNet. [2016-08-03]. （原始内容存档于2016）. ^ McElwee, K. J.; Shapiro, J. S. Promising therapies for treating and/or preventing androgenic alopecia. Skin therapy letter. 2012, 17 (6): 1–4. PMID 22735503. ^ Leavitt, M. Understanding and Management of Female Pattern Alopecia. Facial Plastic Surgery. 2008, 24 (4): 414–427. PMID 19034818. doi:10.1055/s-0028-1102905.